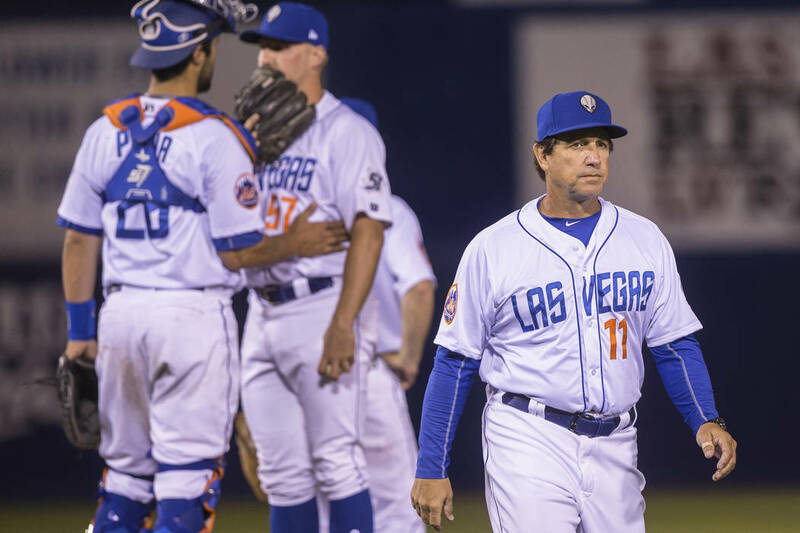 Between several New York Mets injuries and 51s injuries, things have been difficult in Las Vegas. Buddy Baumann and Ezequiel Carrera over the weekend became the latest players to hit the disabled list, two more in a string of injuries the 51s have faced this season. Along with Baumann, pitchers Jamie Callahan, Logan Taylor and Vance Worley (elbow) are on the disabled list. Infielders Gavin Cecchini and David Thompson are injured, along with outfielders Bryce Brentz and Matt den Dekker. All four position players were starters for the 51s when the season began. Baumann left Friday night’s game early, and Carrera left Sunday’s game. Manager Tony DeFrancesco said Baumann had shoulder tendinitis and that Carrera hurt his calf running the bases and would be put on the disabled list on Monday. Callahan, who has been out since April 22, will have shoulder surgery, DeFrancesco said. “We won’t be seeing him anymore,” DeFrancesco said. Taylor, Brentz and Thompson are all rehabbing at the Mets’ facility in Florida. Taylor has been out since May 21. DeFrancesco said he had a “flare-up in his elbow,” while Thompson and Brentz went down in back-to-back weeks. Thompson was hit by a pitch on the hand, suffering a hairline fracture. Brentz fouled a ball off his foot, and DeFrancesco said at the time that he had a fracture in his foot. Cecchini is still out after being hit by a pitch on the foot on May 9, but he remains with the 51s in Las Vegas. DeFrancesco said Cecchini has a bad bruise and is walking but is not yet taking ground balls. And den Dekker is dealing with a knee issue. The 51s were also without Corey Oswalt recently, who had a lat injury. Oswalt is back and will make his second start Monday since coming off the disabled list. All those injuries, combined with Mets injuries that have prompted call-ups from the 51s — Noah Syndergaard, Yoenis Cespedes, Jeurys Familia, Wilmer Flores, A.J. Ramos and Juan Lagares are among the big-leaguers currently sidelined — have made things more difficult in Las Vegas. DeFrancesco, hitting coach Joel Chimelis and trainer Grant Hufford received Astros World Series rings in a pregame presentation on Friday night. DeFrancesco was a member of the Astros organization for seven years. He managed Triple-A Fresno last season. Chimelis worked for the Astros for 12 seasons and was the hitting coach at Double-A Corpus Christi last year, and Hufford was with the Astros for 10 seasons, serving as the trainer at Corpus Christi last season. The 51s finish their series against Round Rock with Smith’s Value Menu Monday, offering select food at discounted prices. After an off day, they hit the road for a trip to Colorado Springs and Oklahoma City. More 51s: Follow Las Vegas 51s coverage at reviewjournal.com/51s and @RJ_Sports on Twitter.